This Website Is No Longer Active. : Major jobs cuts on way in NHS and yet British taxpayers could be forced to pay an additional £1 billion per year to bail out the Greek economy. Major jobs cuts on way in NHS and yet British taxpayers could be forced to pay an additional £1 billion per year to bail out the Greek economy. 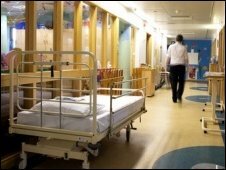 Major cuts in NHS staffing levels which could have "disastrous" consequences are likely after the election, the leader of the nurses' union has warned. Royal College of Nursing leader Peter Carter believes the cuts will be much worse than the deficit crisis of five years ago when thousands of posts went. Mr Carter told the BBC he feared the quality of care was going to suffer because of the squeeze on spending. His warning came on the eve of the RCN's four-day annual conference. More than 4,000 nurses are expected to gather in Bournemouth for the event, which is expected to be dominated by NHS finances. Sir David Nicholson, the chief executive of the health service, has already warned that up to £20bn of savings will have to be found by 2014. This works out as a saving of about 5% a year. The three main parties have all said savings can be made by improving productivity, by tackling management waste and redesigning services. But Mr Carter said he felt politicians from all sides were being overly optimistic. "There are obviously efficiency savings which can be made, but it is pie in the sky to think that the £20bn figure can be achieved through better productivity alone. "The reality is that plans are being drawn up to take money out of the NHS and it will be disastrous for the future." Reports of recruitment freezes have already started to emerge in places such as Essex, Lancashire and Dorset, but Mr Carter believes this is just the start. He said he feared the reaction to the deficits crisis in 2005-06 - when the RCN estimate at least 22,000 NHS posts went with the majority of them from the 600,000-strong nurse workforce - could be repeated on a much grander scale. "We were talking about £1.3bn then. So logic says if they take the same approach, the numbers of jobs going could be much greater and my fear is that front-line services will suffer. "The problem is that it is so hard to identify and stop.About 3,000 nurses a month retire so what happens is these posts are not filled. It does not need redundancies to reduce head-count." A poll of 4,000 people showed 93% were unaware of the savings that needed to be made. The survey also showed the NHS was the third most important priority in the view of the public - behind immigration and the economy. Though Britain is buried in debt due to decades of Tory and Labour mismanagement, British taxpayers could be forced to pay an additional £1 billion per year to bail out the Greek economy, and if the Lib Dems have their way, that figure will be much higher. The British National Party resolutely opposes the single European currency, supports the overwhelming majority of the British people in their desire to keep the pound and our traditional weights and measures, and would withdraw from the European Union. British tax money should be used to rescue Britain first, and not to bail out other nations. Only the British National Party will put our people and our nation’s interests first. How many overpaid administrators per patient are leeching the NHS. Did we have this problem when we had the sister and the matron running our wards. Labour says it supports the NHS ! Why then cannot my daughter get a job after 2 years training as a nurse ? Or even why cannot she get a job of anykind. I am sick and tired of politicians lies but what makes me even sicker is that some people are still lying to themselves. They believe what they are being fed. I am sorry to infringe on your space. I am not a constituent of yours as I live in Bridgend but i saw your website through a BNP search. Thank you for being open and public.